I hope you are having a wonderful weekend. I was a bit more productive today and managed to snap some photos of the new nail polishes from Dior which are released together with the new lipgloss line, Dior Addict Ultragloss. These are not yet available in Germany but I expect them to be out anytime soon. There are three shades of corals and pinks, so nothing really earth shaking there but they made a nice job imitating the different lipgloss finishes as nail polishes. I also got to try the matching gloss to the shade Cosmic and I really liked the consistency. It was pigmented and not sticky. It lasted well for a gloss. As a side note Dior earrings I purchased in Berlin, I am loving them so much right now, even more than my Tribales. These are called Secret Cannage Earrings. They are more comfortable to wear as the earlobe is not pressed too much. Very much recommended. Back to the nail polishes shall we? 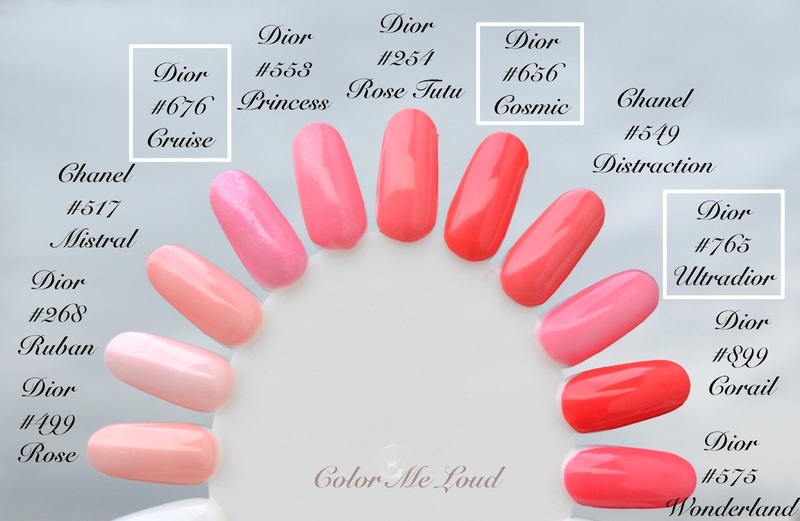 Here are some swatches and comparisons of Dior Vernis #656 Cosmic, #676 Cruise and #765 Ultradior. Hope they are helpful. I believe the intention was to imitate different finishes of the new lip glosses. The sheer glossy finish is represented by Dior Verni #767 Ultradior. This one is a very sheer jelly nail polish. It is almost like a stain on the nails with the first coat. Below I am wearing three coats but you can still see the nail line. If you hate her nail polishes, this is nothing for you. It has its own charm though, looks casual and wearable and the shade is stunning with a good balance between warm and cool. 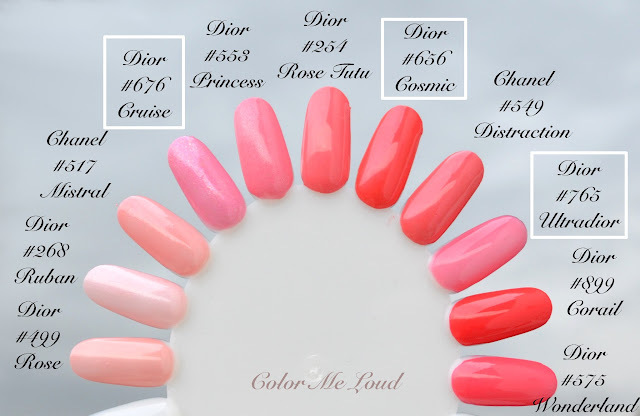 Dior #656 Cosmic is a pink coral cream with lovely pink hidden shimmer. The shimmer is more visible in the bottle than it is on the nails. It has perfect consistency and a great formula. It is opaque in two coats. Below I am wearing two coats as well. 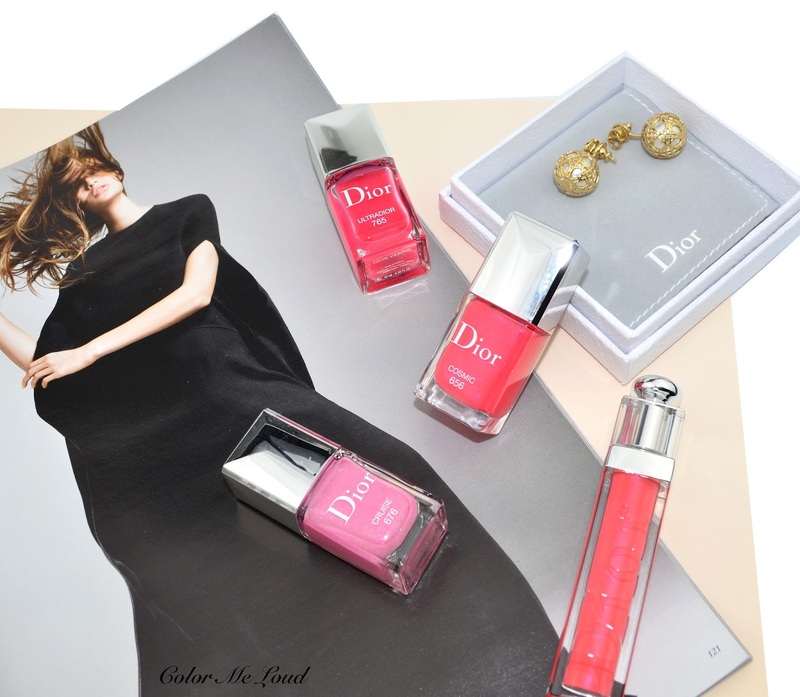 Cosmic is again one of those brighter shades of Dior, different than understated shades of Chanel. I have some comparisons at the end of this post, where you can see the comparison to Chanel Distraction, which has a very similar hidden shimmer but the base coat is not as bright. 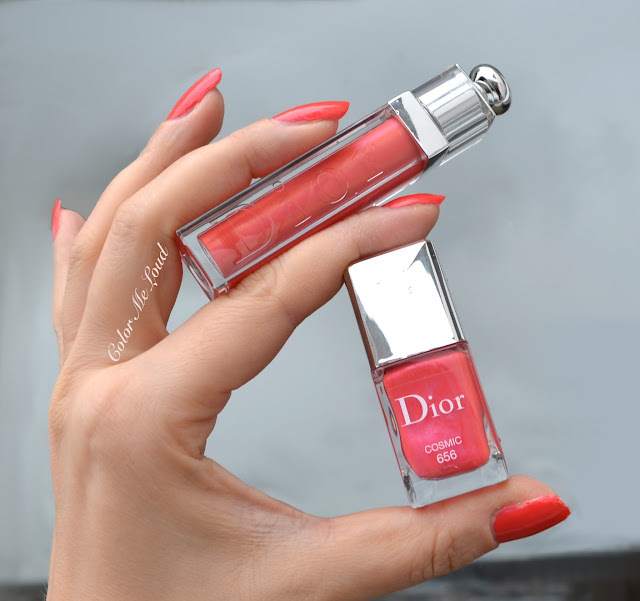 The matching gloss Dior Addict Ultragloss #656 Cosmic has a similar sheen to it. Together they are match made in heaven. 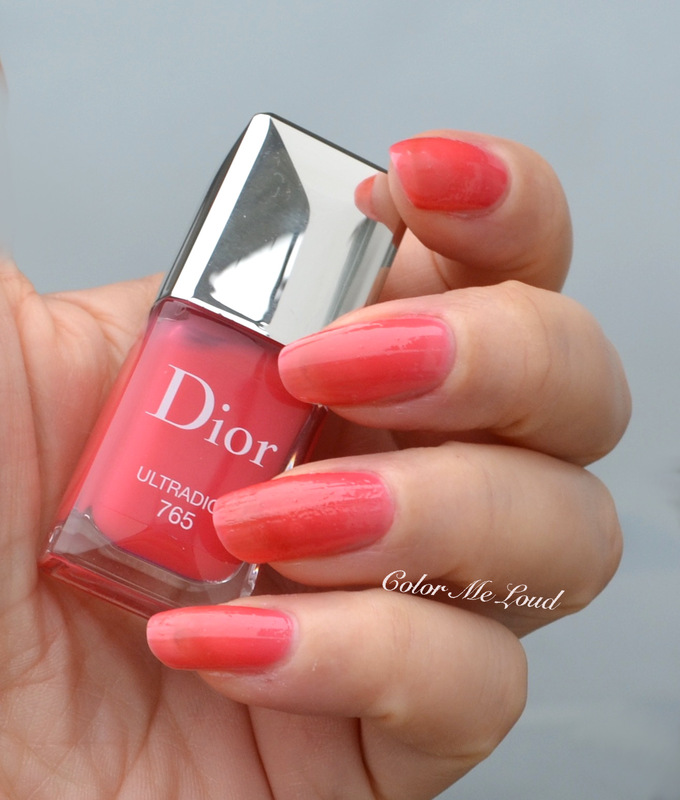 My favorite of the three must be Dior Vernis #676 Cruise which I am wearing while I am typing these lines. It is a cool mid-toned pink cream induced with golden flecks and pink sheen. I love the fact that it is so multi-dimensional. The golden flecks are not too large and they are easy to remove. I find the base color of Cruise unique once compared to the recently released shades as well. It is opaque in two coats and the consistency is great. I am wearing two coats for the photos below. Isn't it amazing how the shade matches the flower? Here are some comparisons for your reference. 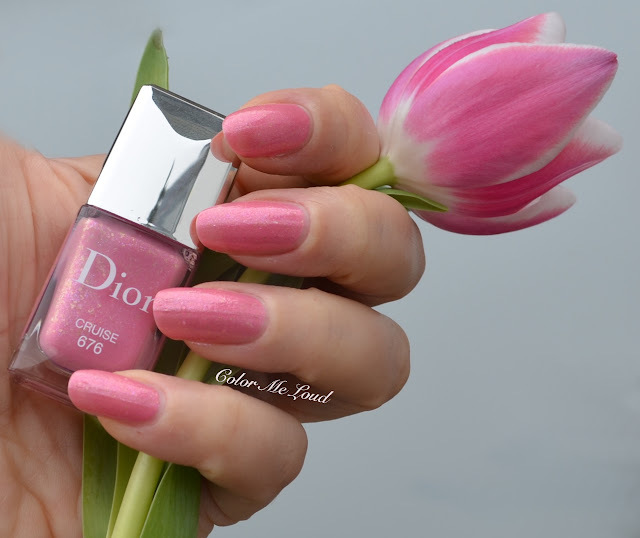 Dior #676 Cruise is much cooler than some of the shades which had similar shimmery finish, such as Dior #499 Rose (reviewed here), Dior #268 Ruban (reviewed here) and Dior #553 Princess. 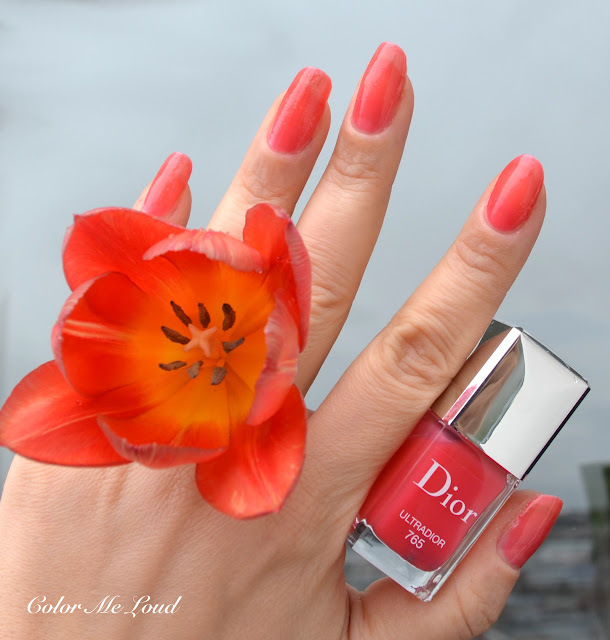 Dior #656 Cosmic is a relatively bright coral once compared to Dior #254 Rose Tutu or Chanel #549 Distraction. 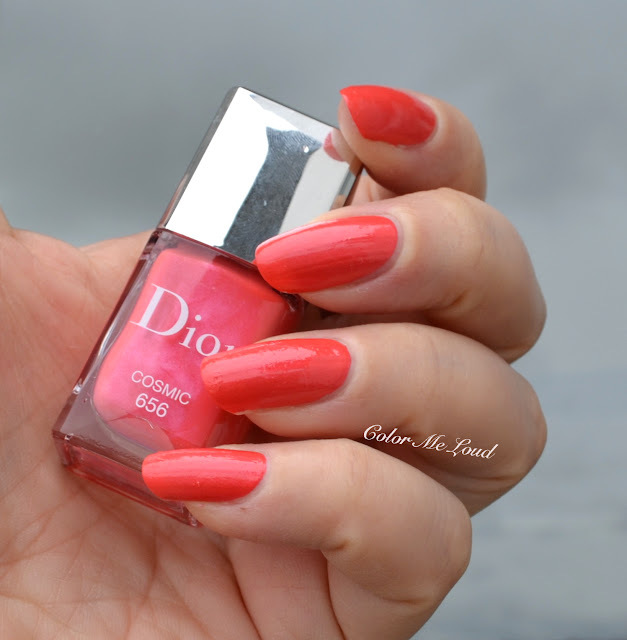 It is closer but a little lighter than Dior #899 Corail (reviewed here). Dior #575 Wonderland (reviewed here) is cooler. Since I am not too much into nail stains, I don't have anything close to Dior #765 Ultradior in my collection. It appears much cooler in the swatches below since the nail wheel is white and it shows through. Please refer to the nails swatches above for more accuracy. Final thoughts: The three new polishes of Dior for Addict Ultragloss Collection are lovely but more generic shades. My favorite is #676 Cruise since it has a unique finish and base color. Cosmic is great for upcoming sunny days (I hope they come soon!). Ultradior is for those of you who don't mind the sheerness and visible nail line. The formula of all three are great. Are you eyeing any of these? Do you like sheer jelly nail polishes? Was für tolle Frühlingsfarben :) Die kann ich mir gut auf meinen Nägeln vorstellen. Allerdings befürchte ich, dass ich da wohl schon ähnliche Farben habe. For this time I'm not crazy at all for this shades : too sheer except Cosmic, this one is pretty but not really unique. Your pictures are very nice, très jolies mains, j'aime les ongles en amandes que je trouve chic et très " Madmen" ! You created a wonderful presentation with nails and flowers! I love your creativity and the quality of colors in your pics! For me definitely cosmic and Cruise are going straight to my stash! Ultradior reminds me of YSL' s late sheer 3 polishes that were released with the lipstick volume shine oil in stick formula! Have you seen these ?especially day Bloomer! I hesitated buying these since for me you have to have perfect shaped nails as yours in order for sheer polishes to be shown nicely.Thank you fir your review ! Oh I was hoping for Cosmic to be a lot more... spectacular? Based on the pictures of the bottle on line I thought the lighter pink shimmer would be a lot more visible and maybe create a bit of a duochrome effect! It's a very classic bright instead. Nice but I already have a lot of those. I wanted to see the earrings TBH! I have noticed them the other day and they suit you really well. Cosmic is lovely, the gloss is calling my name. And I can get it here without ordering. A color I am wearing quite a lot right now - just finisehd a post on spring lipsticks LOL! SECRET CANNAGE!!! I need them!!! My tribales hurt my lobes so much, I can't even use the phone by the end of the day! Crazy, expensive torture. I can't understand women who buy multiples of them! LOLOL! But those cannage studs i love! Erm, but back to the nail polishes. 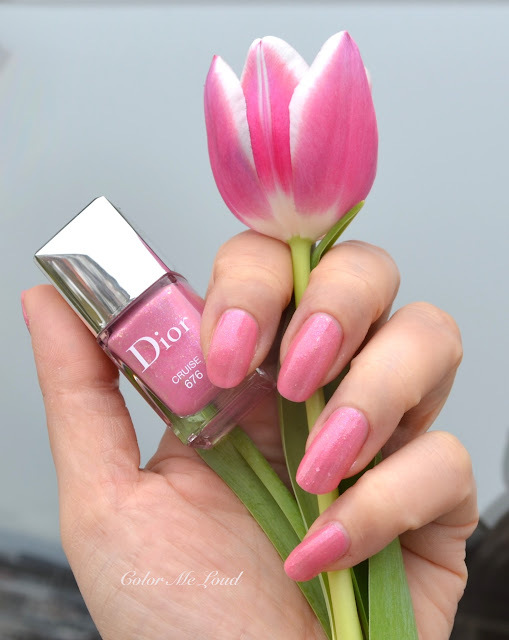 Is it terrible to say that I'm so bored with Dior polishes these days? They all seem the same to me now.... i wish they will go back to those bold, metallic shades they used to release couple of years ago...! LOVE those earrings...I'm a little jealous. :-) A little disappointed in the polishes, however. Cruise is definitely the most interesting of the three, but I'll have to check it out in person to decide whether it's something I would actually wear (I don't tend to wear "flaky" polishes very often).